Ineos's Jim Ratcliffe, boss of the fourth largest chemical company in the world, says the price of energy in the UK is killing prospects for industrial revival here. Ratcliffe, whose firm has operations in 11 countries, told the BBC that the UK was the most expensive and least competitive place of them all when it comes to the cost of power. And he should know - the refineries and chemical production plants Ineos runs, producing everything from petrol to key ingredients for the medical, plastics and construction sectors, are huge consumers of power, particularly electricity. So it’s not just hard-pressed consumers who are being hit where it hurts by rising energy prices – business too is feeling the pinch. The difference being of course that industry is rather more likely to simply up sticks and move its capital elsewhere when faced with a disagreeable commercial climate. What has led to this sorry state of affairs, with record bills on the one hand and threats of power cuts on the other? Well historically the UK has been energy rich, first in coal and then in North Sea oil and first-generation nuclear power. So we could afford the luxury of a pretty much non-existent energy policy, while sticking up a few wind turbines to make it look like big thoughts were being thunk about future needs somewhere on high. That we are no longer energy rich, but rather a net importer of power is an unwelcome fact that our great leaders appear to struggle mightily with. They have yet, as Ratcliffe’s coruscating words demonstrate, to come up with a satisfactory solution. Of course one prospective ray of hope on the horizon is shale gas. Extracted via the controversial process of hydraulic fracturing or ‘fracking’ shale gas is leading an industrial revival in the US and may also, according to new report, be about to do the same in Australia. 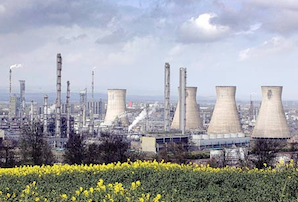 Ineos has already stated its intention to run Grangemouth increasingly on imported shale gas and is looking at the prospects for fracking here in the UK too.